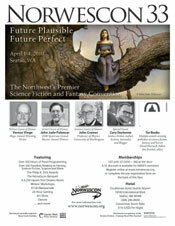 Norwescon 33 is proud to host Vernor Vinge as Writer Guest of Honor. Dr. Vinge is the author of such works as “True Names” (1981), A Fire Upon the Deep (Hugo Award winner, 1992), A Deepness in the Sky (Hugo, Campbell, and Prometheus Awards winner, 2000), and "Fast Times at Fairmont High" (winner Hugo Award for Best Novella, 2002). His latest novel, Rainbows End, won the Hugo and Locus Awards in 2007. 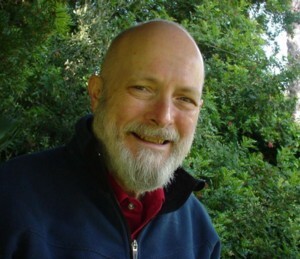 While a professor of mathematical and computer sciences at San Diego State University (he retired in 2000 to pursue writing full-time), Dr. Vinge explored the idea that accelerating technological change would fairly quickly result in a world qualitatively different from today, and in some ways unknowable, in his essay “The Coming Technological Singularity.” His work often deals with people exploring the boundary of this phase change. Dr. Vinge took time this week to talk to Raymond McCauley about important philosophical questions, technology wish lists, and a glimpse of what’s on his desk (including a peek at the draft for The Children of the Sky!) for the Norwescon eNewsletter. Norwescon: Lots of folks know you as the originator of the term "technological singularity", and some people know about your early and eerily predictive take on networked culture and security in "True Names". What don't we know about where you were especially prophetic? Vinge: So far I'm pretty happy with the track record of Rainbows End, though the transition from "this is crazy" to "this is blasé" is happening painfully fast for that novel. Norwescon: Do you have any spectacular misses that you want to share? Vinge: :-) There are some extremely embarrassing miscues in my story, "The Accomplice", which is reprinted in The Collected Stories of Vernor Vinge. It's a good example of a common feature of science fiction: the mixture of wildly wrong speculations with occasional bull’s-eyes. Norwescon: When can we expect Rainbows End the movie? Or a graphic novel adaptation of "True Names"? How do you feel about your work being adapted in other mediums? Such adaptations can be wondrous things (better than the original), but commercial, legal, artistic issues make them rare events. Norwescon: I'm fascinated by how people who create things actually get things done. 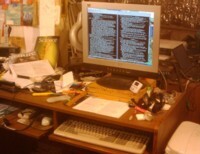 But I hardly ever hear writers asked about their process or their writing environment. Would you be willing to show us your workspace? Vinge: I've attached two pics. Norwescon: What tools do you use when you write? Nowadays, I use network resources all the time of course. 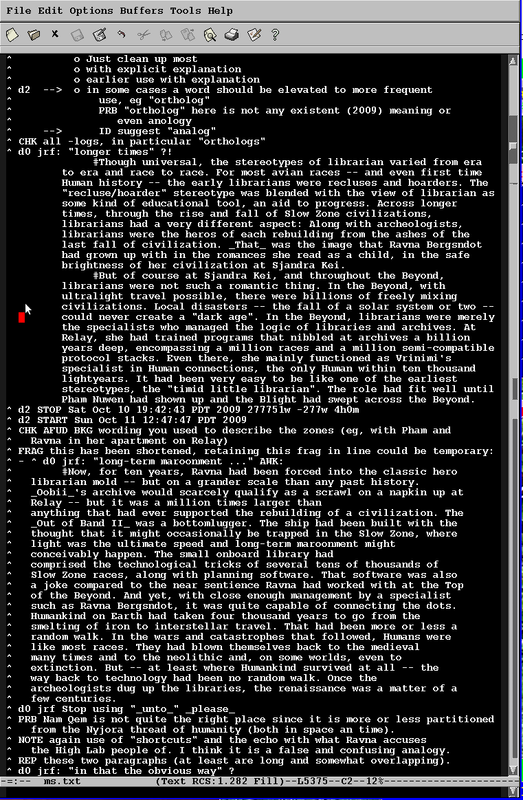 It's hard to imagine what life was like before computers and networks, when discovering facts required days of digging. Norwescon: As an author and speaker, how do you keep organized? 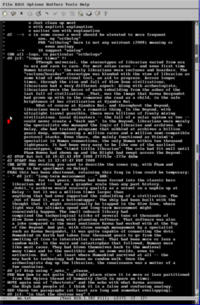 Vinge: Mainly with old-fashioned text oriented apps for mail, record keeping, remindering, and story planning/writing. In more recent times, desktop search has become more and more important for keeping track of the local midden. Norwescon: What is your typical daily work schedule? Vinge: When I'm writing a first draft, I try to do 1500 words (about 5 manuscript pages) per day; when I've done my 5 pages, I can quit for the day! When I'm revising, I generally have an hour-count goal per day. Norwescon: You invented a creative way of dealing with the Fermi paradox in A Fire Upon the Deep, A Deepness in the Sky, and "The Blabber", with your "zones of thought," with physics changing in different areas of the galaxy, affecting levels of technology and intelligence, and Earth in a slow zone. But really, why do you think we aren't hip-deep in advanced alien civilizations? Vinge: Of course, the Zones notion is just a fiction to make these stories possible. I think Fermi's paradox is both a deep philosophical question and a very practical (and important!) question. I have no idea what the answer is. In a way, the Fermi question is the space-like analog of our speculation on the future of our own civilization. It's immensely intriguing to watch modern astronomy close in on Fermi's paradox. Norwescon: Anarcho-capitalists have had a hard time of it lately, with financials markets apparently heading for more regulation and US government taking a more hands-on approach to the health care system. Is this a long-term trend or a short-term swing of the social pendulum? Is "Anarchists, unite!" still a viable rallying cry? Vinge: The pendulum analogy may be accurate -- if one imagines a chaotic pendulum! I think the long-term trend is constructive, toward greater individual freedom. Norwescon: You've talked before about the power of the human/computer interface, and how the intelligence amplification (IA) may bring about changes as profound as artificial intelligence (AI). What cognition-boosting tools do you use? Vinge: I think we're almost to the point of Murray Leinster's story "A Logic Named Joe". I use online search on a minute-to-minute basis (and am impatiently following progress in smartphones/wearables). Also, I have found desktop search engines to be more powerful than any pre-planned organizational scheme. I don't participate in social networks, though I follow their evolution. Norwescon: What other new technologies are you interested in? Are you tracking augmented reality apps on phones? Personalized medicine? Life extension? What's on your radar that other people aren't thinking about yet? Norwescon: What not-yet-available technology/tool/idea have you envisioned that you are eager to have and use? Progress in translational medicine (that is, going from cool bioscience to effective medical treatments). (Though it's not been specifically described in my fiction:) Cheap access to LEO -- and a real space program! Wearable computers (even just widespread consumer-available head-up displays). Given the acceptance of Bluetooth headsets, I think/hope that HUDs should be consumer items soon. Automobile driving automation. Alas, partly for legal reasons, this could be a long way off. Norwescon: Here’s the obligatory "are we there yet?" question. In 1993, you famously wrote, "Within thirty years, we will have the technological means to create superhuman intelligence. Shortly after, the human era will be ended." At roughly the half-way point, are we still on-track? Vinge: So, I said I'd be surprised if the Singularity happened before 2005 or after 2030. I think we're "on track". I believe there are four or five different paths to the Singularity. From year to year, one or another may seem to be the front runner. For example, nowadays networked embedded systems are going like gangbusters. Pure AI has been in eclipse, but the kinds of supers we'll have in the Teens may generate some interesting surprises. Norwescon: If someone hasn't read your work before, what's the best starter piece? Vinge: If someone is already a science fiction fan, I would say to read A Fire Upon the Deep (from Tor Books). If someone is new to science fiction, I'd suggest browsing The Collected Stories of Vernor Vinge (also from Tor). Norwescon: Can you tell us what new projects you're working on now? Vinge: I'm working to finish The Children of the Sky. This is a near-term sequel to A Fire Upon the Deep. Norwescon: What do you not get not asked about, that you'd like to share? Vinge: I think more attention and mitigation planning should be given to failure scenarios for networks and embedded systems. Norwescon: Thank you! We look forward to seeing you in April!